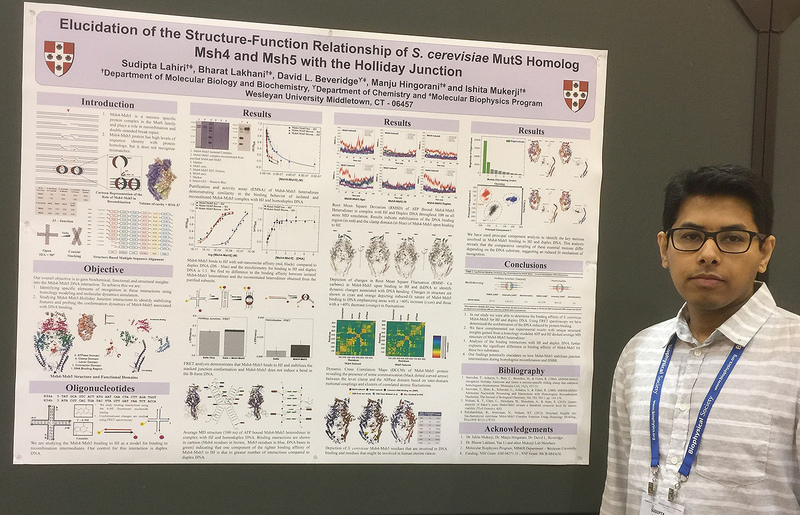 Three Wesleyan Molecular Biology and Biochemistry majors received the unique opportunity of presenting their thesis work at the 61st annual Biophysical Society meeting in New Orleans, Feb. 11-15. 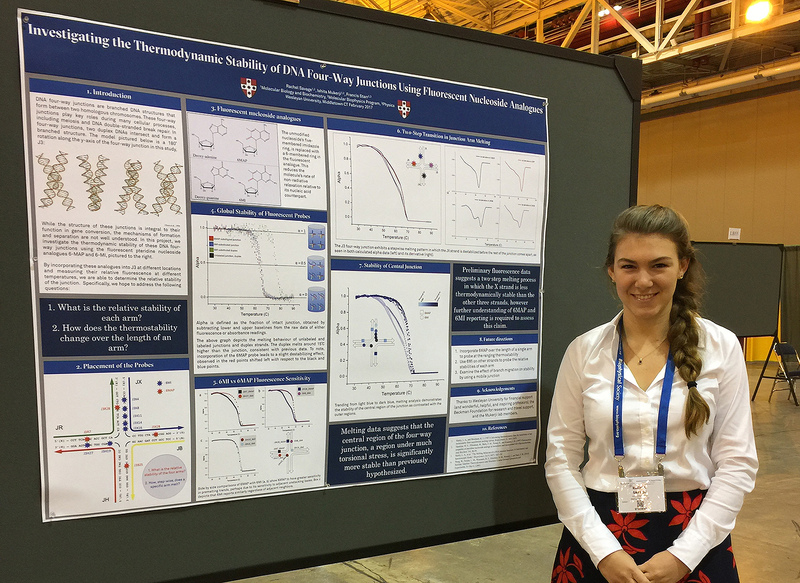 Rachel Savage ’17 presented her senior honors thesis titled, “Investigation of the Melting Thermodynamics of a DNA 4-Way Junction: One Base at a Time,” which was done in collaboration with Francis Starr, professor of physics. Molecular biology and biochemistry graduate student Sudipta Lahiri presented on the “Elucidation of the Structure-Function Relationship of S. cerevisiae MutS Homolog Msh4 and Msh5 with the Holliday Junction.” Lahiri’s advisor is Ishita Mukerji, the Fisk Professor of Natural Science, professor of molecular biology and biochemistry. He also completed his research with the help of Manju Hingorani, professor of molecular biology and biochemistry, and David Beveridge, the Joshua Boger University Professor of the Sciences and Mathematics, professor of chemistry. 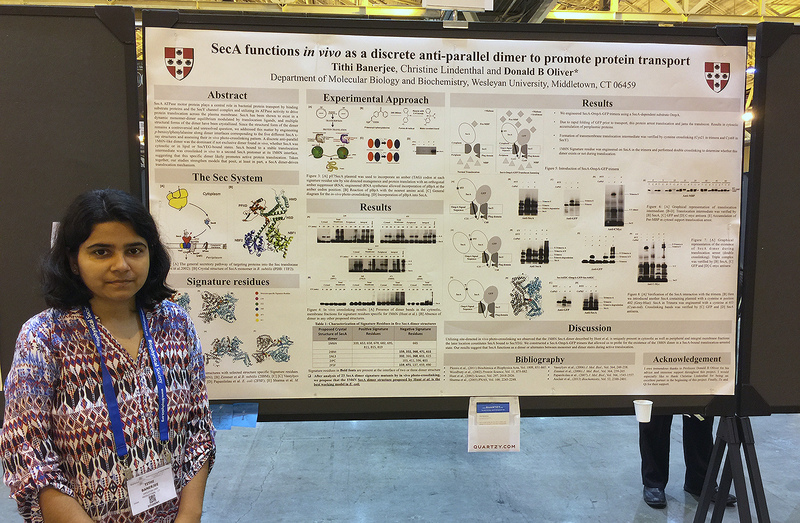 Molecular biology and biochemistry graduate student Tithi Banerjee shared her graduate thesis work on “SecA Functions in vivo as 1M6N-like Dimer to Promote Protein Transport.” Her advisor is Donald Oliver, the Daniel Ayres Professor of Biology, professor and chair of molecular biology and biochemistry. More information about the conference and its events can be found here.